The holidays are here! I love so many things about this time of year…the crisp air, the cheer, the community togetherness, and the chance to show your loved ones how much you care. Gifts are an important love language for me, as they are for many people. And the holidays are a special time when you can get gifts for the people who mean a lot to you and treat them to something that makes them feel great. This is especially true when you’re in a relationship. So, if you’re a man out there who’s a millionaire, or just wants to make his gal feel like a million bucks, I have some gift ideas for you. These gifts are guaranteed to make any woman feel amazing and so fortunate that she’s dating you. Getting your lady a watch is a great idea, especially if your woman isn’t as into jewelry as the normal girl is. Watches are jewelry with purpose! Get her something unique that she doesn’t already have in her jewelry box. I’ve very into the watches that wrap around the wrist several times. There’s something so edgy and unexpected about them. 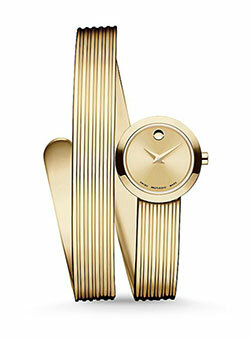 One of my favorites is this Movado Museum Wrap Goldtone Stainless Steel Bracelet Watch. It’s a wearable piece of art! Check her calendar and find a night that she’s free. Then, get her tickets to a show that you know she’ll love. Maybe a favorite band of hers is coming into town. Or, if you’re stumped, get her Hamilton tickets. If you don’t live in the New York area, even better! You can plan a whole romantic weekend around the show. Hamilton is THE Broadway show everyone’s talking about and if your lady hasn’t seen it yet, this is a must-get for her holiday gift. 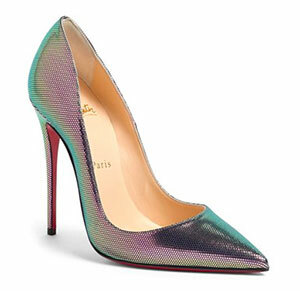 Christian Louboutin shoes are the gold standard of women’s footwear. Every woman should own a pair. And if your lady already has a pair, or several, then she has fabulous taste and will certainly appreciate expanding her collection. You know her taste better than I do, but I think when you’re gifting something, you should buy a treat your woman wouldn’t normally get herself. So, don’t go for something boring like black or neutral heels. Pick out something really special that will turn heads whenever she wears them. My selection of the season are the So Kate Pointy Toe Pumps. The iridescent finish is beyond eye-catching, but they’re very wearable because with all of the colors, they go with any outfit. Give your woman a special experience for the holidays instead of just a gift. Think about what she really likes and then explore what you can do with that. For example, if your lady loves roses, you could look into a special evening at the local botanical gardens with a rose expert. Or, you could hire a private chef to craft a rose inspired menu for a very special evening together. Planning an experience is a lot more work than your typical holiday gift, but your lady will love and appreciate every second of it. Trust me. Everyone gets their girlfriend and wives jewelry. Make your jewelry gift different by getting it engraved with something meaningful to the two of you. Maybe you can engrave the inside of a bracelet with the coordinates of your first date. Or get her a special locket with the lyrics to a song that you both listened to for the first time together. You can also find places that will engrave your fingerprint onto precious metal, which could be very meaningful. If you’re looking for something special to engrave, I’d recommend this Lana 14K Electric Diamond-Trimmed Ring. I’ve never seen anything like it and I think it would appeal to a broad range of tastes. No woman can have enough evening bags, so this is a safe bet. Plus, you don’t have to deal with sizing, which can be touchy when buying gifts for women. A really fun idea would be to give her a gift of an evening bag with the above mentioned tickets or experience gift. Tell her that the first time she uses the bag can be on the special date you planned for her. She’ll love that. 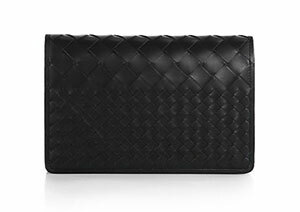 You can never go wrong with leather from Bottega Veneta. I love their Intrecciato Montebello Clutch. It’s a classic look in such high quality craftsmanship. She’ll have this bag for decades and remember how thoughtful you were when you picked it out for her every time she wears it! If you’re in a newer relationship with your lady, you can’t get too intimate or personal with the gifts. But, you still want to let her know that she’s your special someone this holiday season. So, where does that leave you? I say head straight to Jo Malone London. This brand has amazing scents and candles that are incredibly luxurious. They’d be a treat for anyone! Get something from their Pomegranate Noir Collection and you’re set. It’s such a yummy scent. It’s sure to be a hit! Hope this helps in your holiday hunting! Best of luck beating the crowds and finding the perfect gift for your perfect woman!